Ex-Barcelona forward David Villa has boldly claimed that his former club owe their successes to the evolution of their current captain Lionel Messi, whom he has dubbed, "the greatest player of all time". Since his emergence into the spotlight, football fans have constantly debated Messi's 'greatest of all time' status with that of his longstanding rival Cristiano Ronaldo. The 31-year-old has won numerous titles and broken unprecedented individual records during his stint with the Catalan giants so far. This season, the Argentine has been in devastating form, having netted 43 goals in all competitions, 33 of which are league goals. 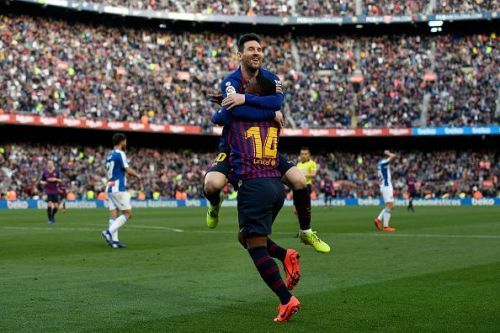 Under the leadership of Messi, Barcelona currently sit nine points clear at the top of La Liga and have a first-leg advantage going into the second leg of their Champions League quarter-final fixture against Manchester United. The club have also progressed to the final of the Copa del Rey after knocking rivals Real Madrid out of the competition and could get their hands on another treble, should things go their way. Villa, who spent three seasons with Messi at Barcelona, has hailed the five-time Ballon d'Or winner as "the greatest of all time", even ahead of footballing icons like Pele, Diego Maradona and Johan Cruyff. "Leo Messi is the greatest player of all time. Barcelona owes its success to his evolution: a direct style of passing play based on possession. "Obviously with the likes of Pele, Diego Maradona and Johan Cruyff, I didn't have the chance to watch them like I used to see Messi every day, in every game. But, in my opinion, Messi's the best." The much-awaited second leg of the Champions League quarter-final between Barcelona and Manchester United will take place on April 16 at the Camp Nou.